This add-on is available in the Plus and Pro editions of MemberPress. Amazon Web Services (AWS) is a set of tools provided by Amazon to help people host websites, files and do many other things. Amazon S3 is one of the services offered in Amazon AWS ... it allows you to upload, host and protect files and be backed by the reliability, security and speed of Amazon.com! Amazon AWS is widely used by individuals, fortune 500 companies and every other type of entity in between. You can sign up for Amazon AWS very easily -- it's pay by usage and quite inexpensive. Make sure your bucket names only contain *lowercase* letters, numbers and dashes ... and that it starts & ends with a lowercase letter. You can read more about these restrictions on Amazon's AWS developer resource website. Alternatively ... There are now some services & programs that connect with Amazon S3 ... a couple of these are Cyberduck (Mac only) and FTP2Cloud (similar to DropBox's interface). Try to make sure that any of your folder names and files only contain uppercase letters, lowercase letters, numbers or dashes ... please try to avoid spaces & special characters in your folder and file names. While this isn't specifically forbidden by Amazon S3's guidelines, special characters (including spaces) have been known to interfere with MemberPress AWS's ability to work properly. 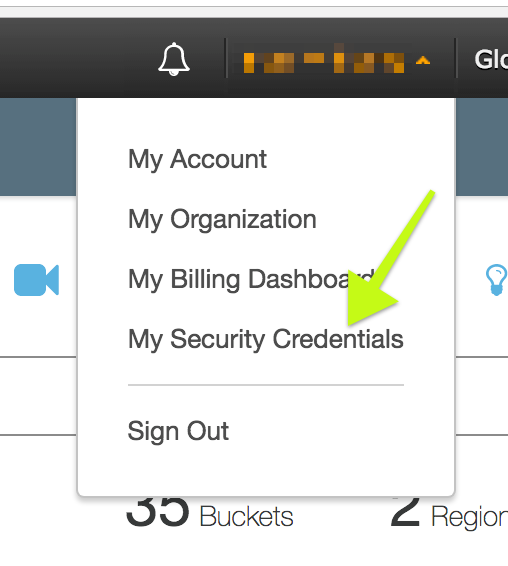 Before you can start using MemberPress AWS you have to enter the Amazon Security credentials associated with your account into your MemberPress website's Options page. You might then see this pop-up if you haven't accessed this area before. Choose "Get Started with IAM Users". Next choose to add a user and enter a username with Access type* selected as "Programmatic access". Now you'll set permissions for this new user. Under the filter search for "AmazonS3" to bring up the S3 permissions options. Select the "AmazonS3ReadOnlyAccess" option and click "Next". Review everything and make sure it looks like the screenshot below. If so, click "Create User". Lastly you'll need to download the CSV file and keep it safe somewhere. It's IMPORTANT to make sure that your buckets and the files in your buckets are not publicly accessible, as that would defeat any protection of direct access to those files. rule: This identifies the id of the rule that should be used to determine whether or not to display the shortcode. target: Set to "new" to open links in a new tab. This option only applies to the mepr-s3-link shortcode. download: Set to "force" to force the user's browser to download the file when they click the link instead of opening it in the browser. This option only applies to the mepr-s3-url and mepr-s3-link shortcodes. This shortcode is used to calculate and print out an Amazon S3 expiring link. This shortcode is used to calculate an Amazon S3 expiring link and display it as the href of a link. This shortcode needs to wrap the text you want displayed for this link. These shortcodes are used to embed protected audio and video files onto your pages and posts. Aside from the expire and rule attributes ... and the fact that the src attributes represent file paths for Amazon AWS S3 these shortcodes behave exactly like the audio and video shortcodes built-in to WordPress itself ... including the ability to include fallback video files to maximize compatibility across all browsers. Since the underlying links to audio and video content displayed with these shortcodes are expiring links ... if any file lasts longer than the expiration time there can be issues with users scrubbing video forward or back. The longer the expiration of the links is the more chance there is for users to download your video content. Recently Amazon AWS introduced a new way of "signing" expiring urls which they call V4 signatures. The MemberPress AWS addon now supports V4 signatures. These new signatures are more secure than the original way Amazon has signed expiring urls but are computationally more complex and so we still recommend you stay with the old signature formats if you can. Some newer Amazon AWS regions only support V4 signatures though. If you decide to use V4 signatures you'll need to be prepared to also supply MemberPress AWS with the AWS region that you're using.